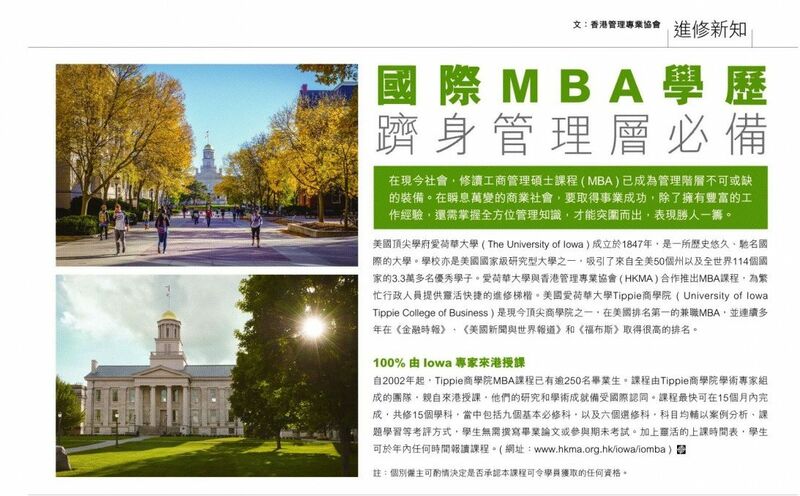 Top-ranked MBA - Tippie College of Business of The University of Iowa has an international reputation as one of the world's best business schools. 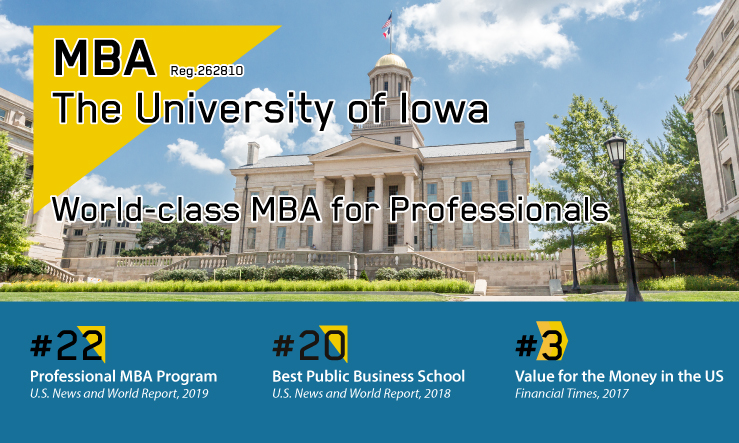 By earning an MBA consistently ranked by Financial Times, U.S. News & World Report, and Forbes, you'll enjoy world-class experience with high-caliber classmates..
Iowa faculty come to you - You'll learn, in person, from the same faculty who teach in Tippie's on-campus MBA programs. They make up a team of academic professionals who are internationally recognized for their research and achievements. Work as you learn - Keep your career trajectory moving upward and earn your MBA at the same time. Our program is ideal for working professionals. Each course only takes two week-ends. Achievable - Attainable in 15 months with no thesis, no term-end examinations. 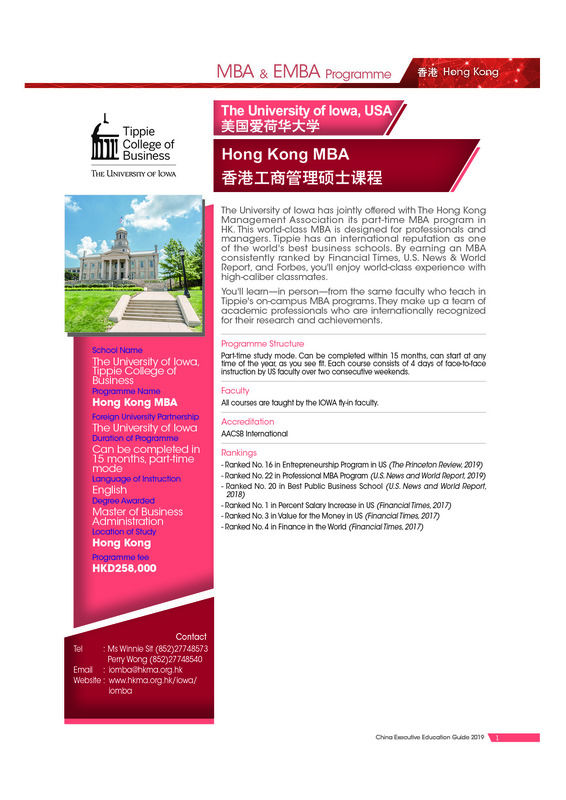 "The teaching faculty members sent to Hong Kong from Iowa Tippie school are excellent. Most of them are hybrid experienced professors with broad knowledge and views, so students can gain authentic learning experiences from this quality US MBA program without worrying about quitting job. This is very unique and rare in Hong Kong." "The program is considered a fruitful and enjoyable journey for me. I especially valued the world-class learning experience with face-to-face lectures and the bonding with high-caliber classmates, what make this program so dynamic and remarkable." "The MBA taught me how to better plan, measure and delivery results. Skill development is necessary to compete in this advancing world, Iowa's MBA contribute in many ways for my grow." * The schedule is subject to change due to unforeseen circumstances. Highly flexible to enrol in any other modules in any time of the year. For module schedule, please refer to the time schedule above.